Bnest was founded in 2016, we aim to provide good products with worth affordable price. We are focus on electronic products, our projector is well made and high quality. Projection Size: best size 50"-120"
1. 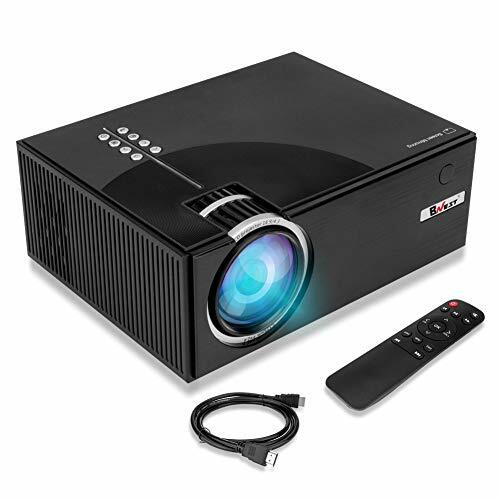 This projector is designed for video/movie in dark environment NOT RECOMMEND for WORD, EXCEL,PPT or BUSINESS PRESENTATION. 2. The project size can be only changed by moving the projector. 3. For better sound performance, please connect an external speaker through HDMI or RCA L/R jack port. Doesn't support Dolby audio. 4. If you need close the internal speaker, please press the button on the remote with a symbol"speaker". 5. For full screen when use USB source, please press the play/pause button on the remote control. SMALL HANDHOLD PROJECTOR: BNEST hand-hold projector (L*W*H: 7.97 * 6.10 * 3.10inches). Easy to carry into a bag which allows you take to anywhere you want. Our home video projector is also equipped with a remote control, extended lamp life for about 50,000 hours, long life time and convenient for you to use. BETTER VISUAL EXPERIENCE: BNEST HD projector, supports 720P, 1080P video, brightness upgraded to 1500 lumen which is 125% brighter than former video projector. 1200:1 contrast ratio and 39inch-118inch projection distance (Best for 80inch). Ideal for projecting movie, games and pictures. NOTE: It is a home cinema projector only, Not recommend for PPT or office presentation. RICH MULTIMEDIA PORTS: BNEST LED movie projector equipped with a variety of inputs, support HDMI/USB/VGA(PC)/Composite AV/Headphone/SD port. This projector can support laptops, smartphones, tablets, USB drives, DVD players, Amazon Fire TV Stick and Xbox Hulu, Netflix, YouTube and others. NOTE: Before connected with smartphones, Android users need download an APP-EZcast in Google Play, then connect your phone with USB cable. LOW NOISE AND POWERFUL SPEAKER: To reduce fan noise, the home theater projector comes with an upgraded cooling system which makes noise far below the industry level. Besides this projector built-in 2W high power speaker that offers excellent audio support. If you have any questions about this product by BNEST, contact us by completing and submitting the form below. If you are looking for a specif part number, please include it with your message.